Get yourself a good cup of java and a comfy place to sit because you are in for a treat with this month's Featured Farmhouse. 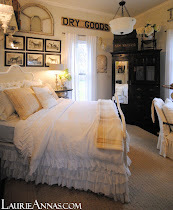 What do you get when you have one design savvy lady, who’s been raised on a farm that loves everything vintage? Someone who wields a paintbrush and a duel point driver with ease. 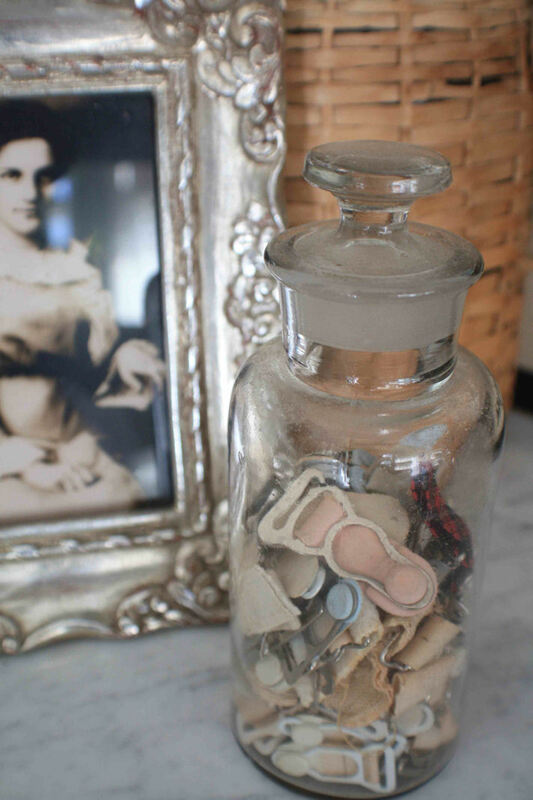 Who can see potential in furniture and things most of us would throw out? Throw in a talented husband that works along side her. Add in kids and grandkids that she adores. And an adorable farmhouse that she restored. Plus she gardens and cooks and loves the Lord. And her given name fits her to a T because she spreads it wherever she goes…. 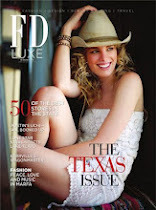 I can only be describing one person because they broke the mould after creating her …the savvycityfarmer…Joy Waltmire! 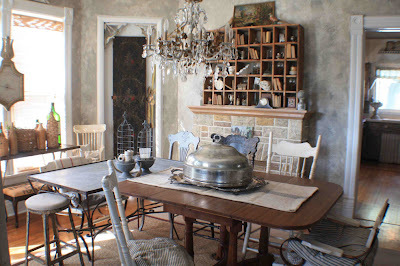 Yes, today we are traveling north from Texas …all the way to the suburbs of Chicago to visit the charming farmhouse of Joy Frey-Waltmire and her husband Don. Some of you may already know Joy as savvycityfarmer, which is the title of the blog she has written for 6 years. Her home, which she and her husband have lovingly restored, has been featured in numerous publications including the 2011 Autumn addition of the Danish magazine The Jeanne d’ Arc Living and Fifi O’Neall’s latest book, Romantic Prairie Style. 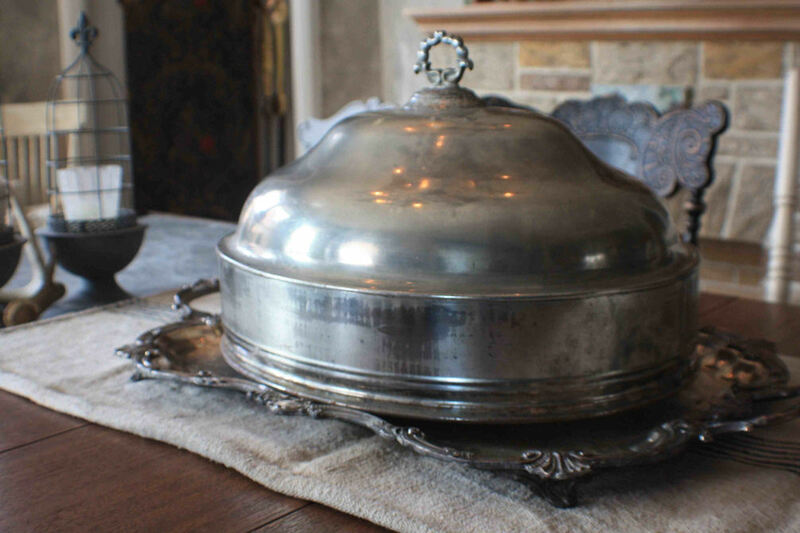 Born and raised on an Indiana farm Joy was introduced to antiques and auctions at a very early age. She loves natural elements and palettes of neutrals, incorporating found objects of interest in her home and designs. 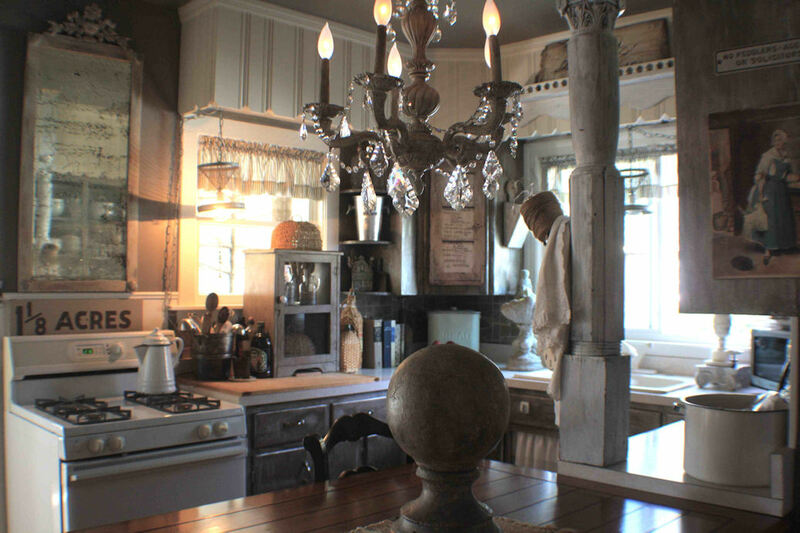 When Joy is not working on her farmhouse she uses her God given talents to style and redesign furniture and decorative items for her clients. With no formal training, she has developed her eye for design and repurposing from 35 years of free lance design and 10 years of shop keeping. 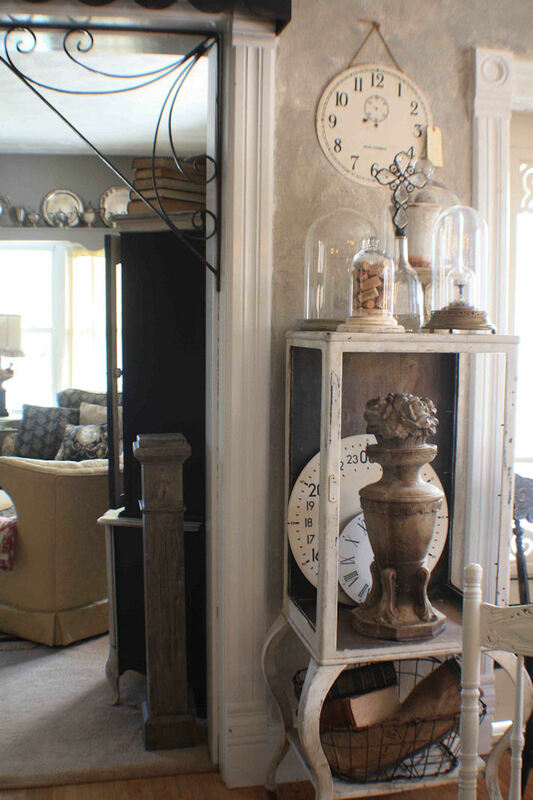 A large part of her business is buying and selling antiques and items that she and her husband redesign. Together they run the home-based business from their potting shed. 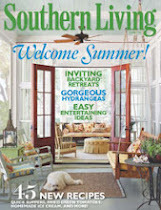 Twice a year, spring and fall they host a selling event in their backyard that draws shoppers from all over the country. 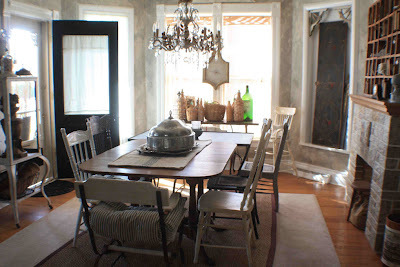 Full of inspiring photos, Joy not only shares her farmhouse and family but also gives instructions for paint techniques and redesigns. And even wedding design on a budget! 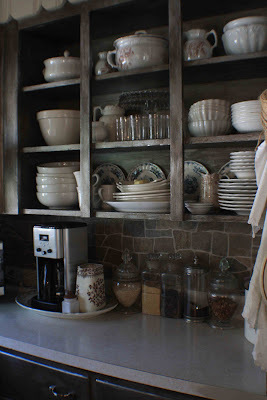 Joy has graciously taken time from her design business today to answer some questions and share her farmhouse with us. 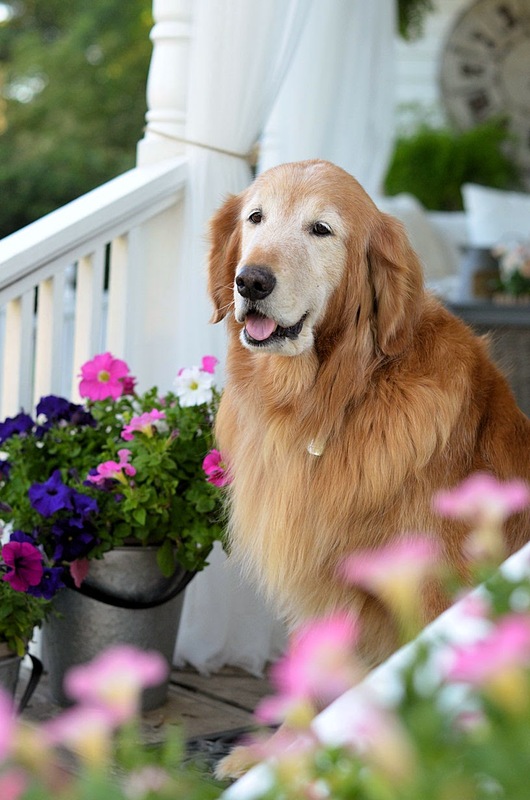 Come sit with us on the front porch as we talk to Joy…. 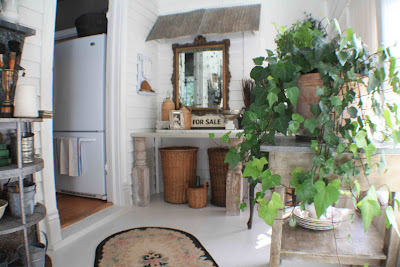 Joy…your farmhouse is beautiful! How old is it and how long has it owned you? We have lived in the farmhouse for fourteen years. The house dates to 1870. Have you made many changes through the years? 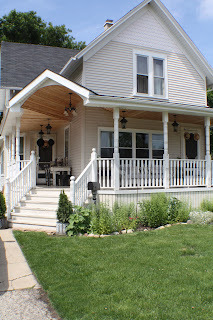 Eight years ago we chose new siding, designed and had built a wrap around porch. When that project was finished we capped it off with a potting shed redesign. Originally our shed was the carriage shed. We covered the existing concrete floor with a raised wood floor and placed bead board on all the walls. It then became my painting and selling (“Shop the Shed”) venue. A few summers ago we completely reworked the landscape and created a pea gravel courtyard surrounded by boxwood and hydrangea. What one excited you the most and made the biggest difference? 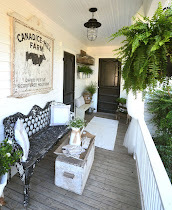 I was the most excited with the wrap around porch … being a farm girl and all, the pea gravel courtyard is by far my favorite. We always had a gravel driveway as a kid. My parents still do. 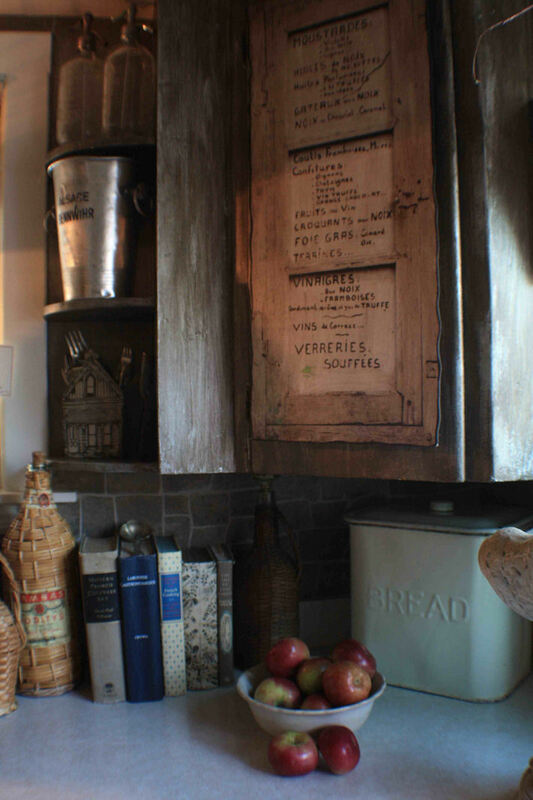 It transports you to Europe and gives the old farmhouse a very rustic rural aura. 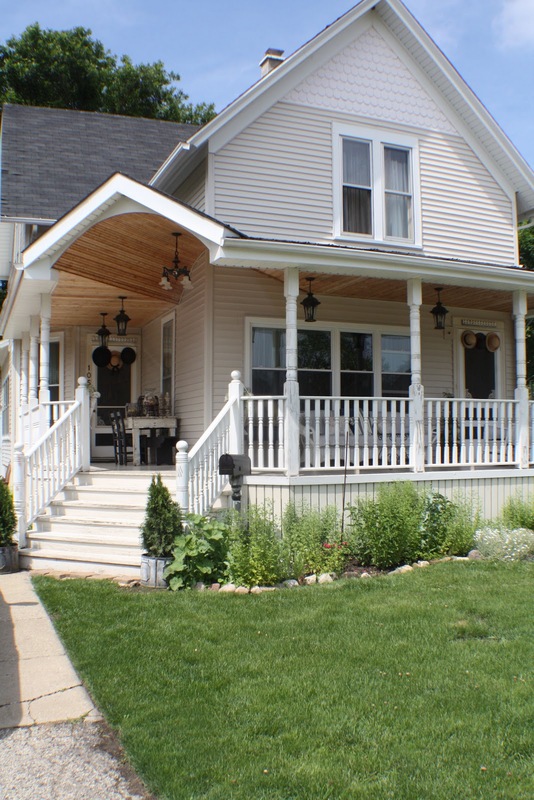 We did the design every step of the way, but had the wrap around porch built by a builder who specializes in circa 1800’s homes. Your walls are beautiful! Can you tell us about them? Years ago I had a concrete bust statue of a woman. It was literally the color of stone. I mixed and poured and tested until I matched her patina. I applied the watered down paint with a brush, wiping off with a damp terry cloth towel as I went. 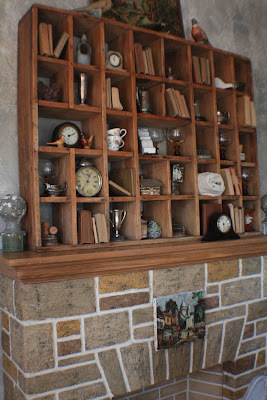 However, because our walls were old plaster the technique enhanced itself creating the exact look of stone. 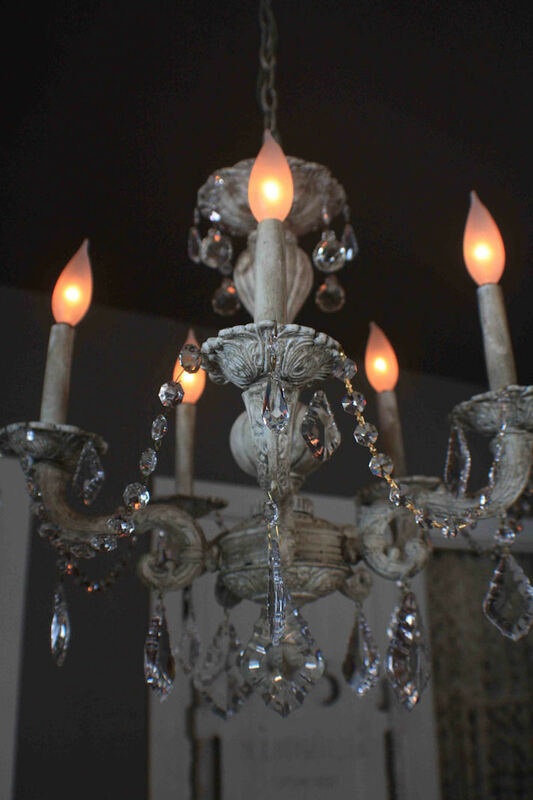 How do you define your style and what is your inspiration? I am truly inspired by styles and sophistication that I see on line. I am not a copy cat, though. 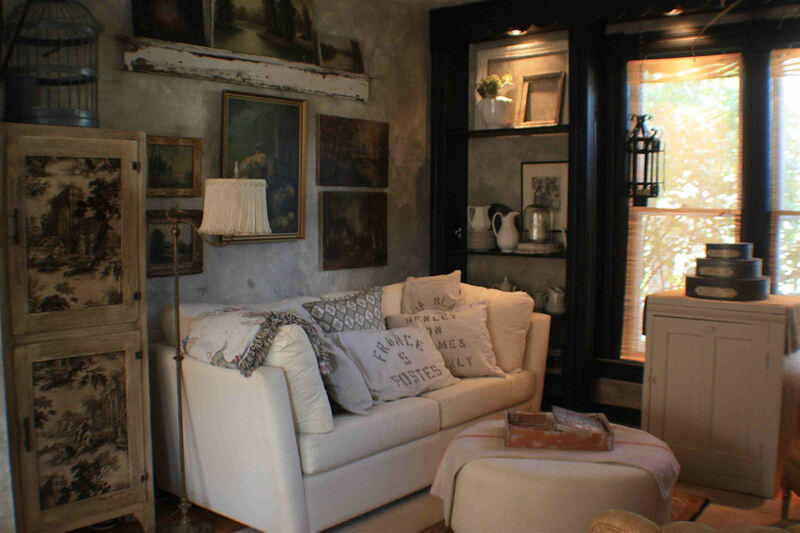 I adore the mix of farmhouse, industrial, a little romance and a lot of texture. 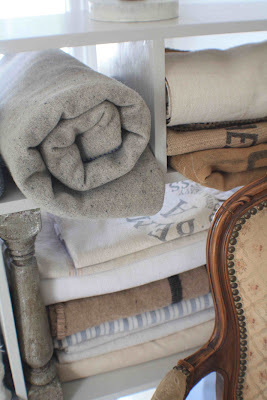 It’s funny, I been buying and using burlap for as long as I can remember. When a magazine cover gets a hold of what they think a trend is, all of a sudden it evolves in to just that. 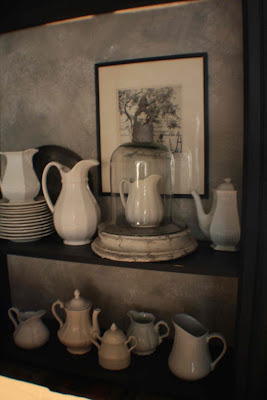 For another example, I have collected white ironstone for 30 plus years … I just didn’t happen to be the gal who wrote a book about it. Are you catching what I’m saying? I call my style ‘European Romantic Farmhouse’. Can you give us some advice for achieving that look in our own homes? I WILL find a place for it, even if it means storing something else, or perhaps moving it on to someone else. 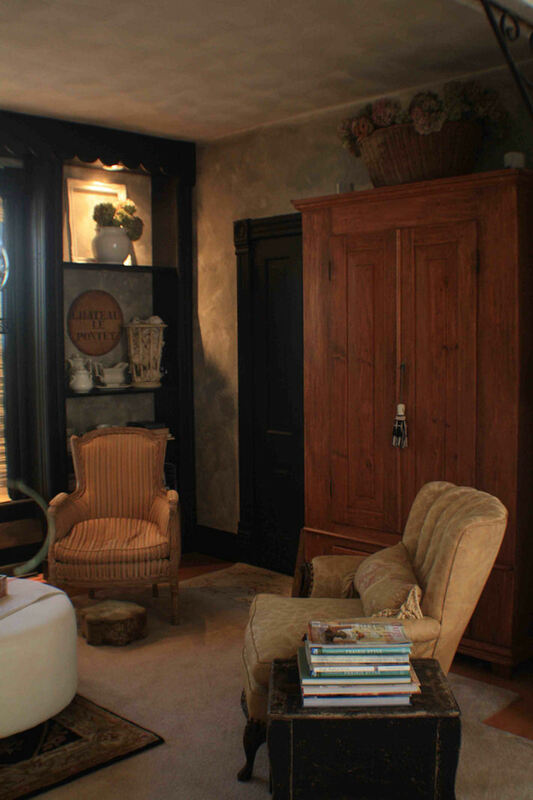 Buy a few drama pieces, like a great cabinet for the TV, or a sturdy pair of Louis side chairs, great lamps … and vintage leather books! So in a nutshell, I buy what I love and mush it all together. 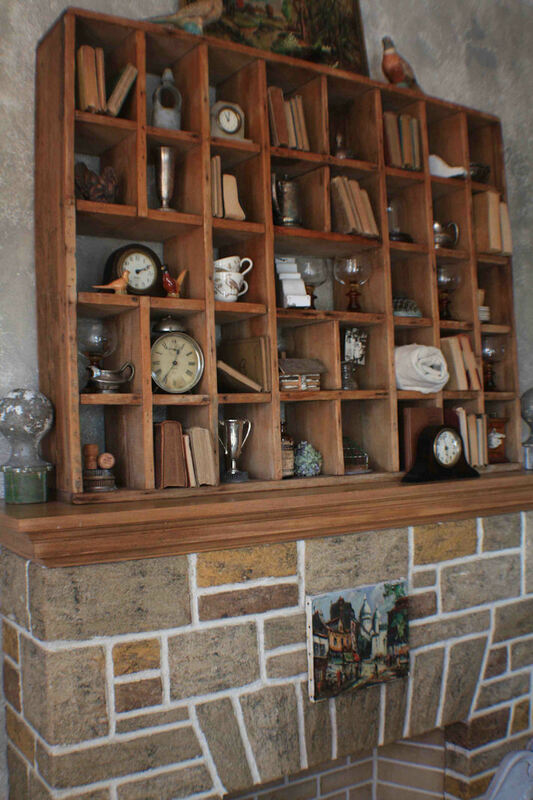 In your home we see many wonderful and interesting collections. Tell us about your favorites. I adore hotel silver, white ironstone, brown transfer, demi johns (wicker wrapped bottles) textiles i.e. 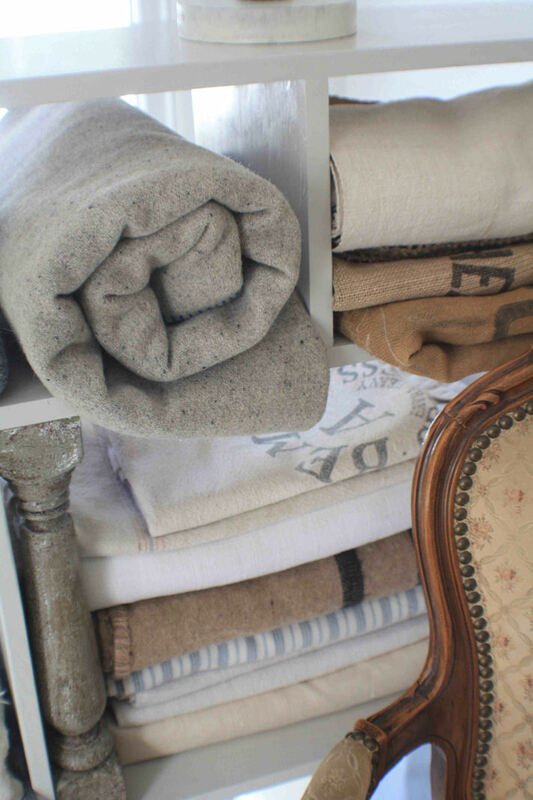 grain sacs, blankets and linens with texture, landscape oils, apothecary bottles, anything galvanized, and so on and so forth. Truth be told, I would have to claim that the galvanized pieces I own are fast becoming my favorite. It’s really hard uttering those words, though, because remember, I only have what I love around the house. It all has purpose and you will find me using every little thing I own, from wine for a party in a galvanized tub to a Thanksgiving turkey on a brown transfer platter! We understand your kitchen underwent a face lift recently including your cabinets…what changes did you make? I was inspired and determined to create the look of old tin on my kitchen cupboards. Every day I would look out at the potting shed and see the old tin my husband so lovingly put on the roof. The tin came off of my great grandpa’s chicken shed and was hauled here from Indiana in my Dad’s pickup! My son in law painted and did some wall papering on my backsplash. The walls are “Eiffel Tower” by Pittsburgh Paint and the wall paper is off the shelf from a local hardware store. 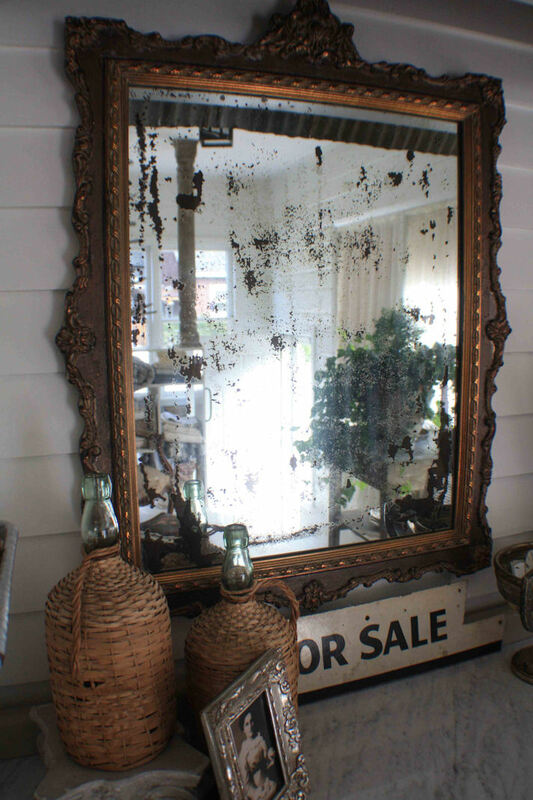 Looking through your photos we see only a few “new” items…i.e. your coffeemaker. 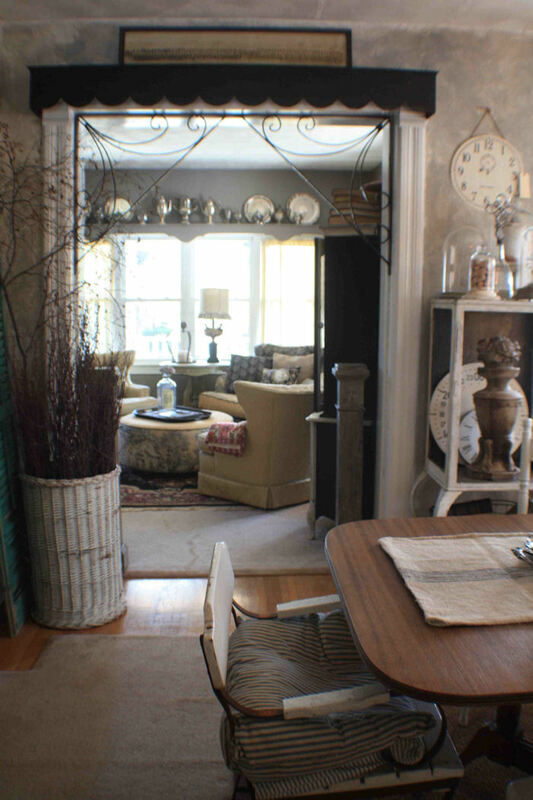 Have you always lived with this “vintage” look? The TV is not a necessity here and is only used for movies so it’s hidden in one of those great old armoires I was referring too. I have no dishwasher. I do love me my coffee pot and my stainless microwave, but I bought the smallest microwave that I could find so that it would not become the elephant in the room. I have a simple white stove and fridge. 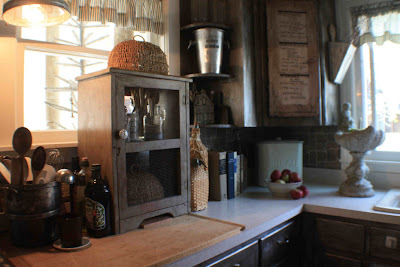 My food storage is a butler pantry and an old Iowa farmhouse pine cupboard. As an accomplished decorator you refurbished vintage furniture with special paint techniques for your clients… do you sell your items in a store? I sell my furniture redesigns to various shopkeepers here in the Chicago burbs and across the country. (You can find the list on my blog sidebar) I also do a lot of free lance styling after hours for local boutiques. Twice a year my daughter and I host a large sale called “Shop the Shed” in my potting shed and back yard. 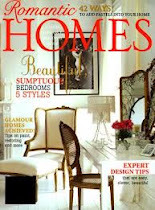 Our next sale is in May 2012. What furniture project(s) are you working on in your studio at this moment? 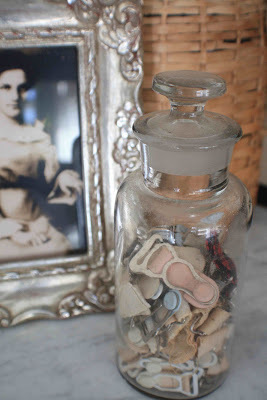 I am preparing a load of repurposed accessories for a big home show this weekend. I’m using a lot of glitter and goo and sheet moss, too. I will be taking some portable pieces of furniture, side tables and a fabulous collection of small benches and stools. 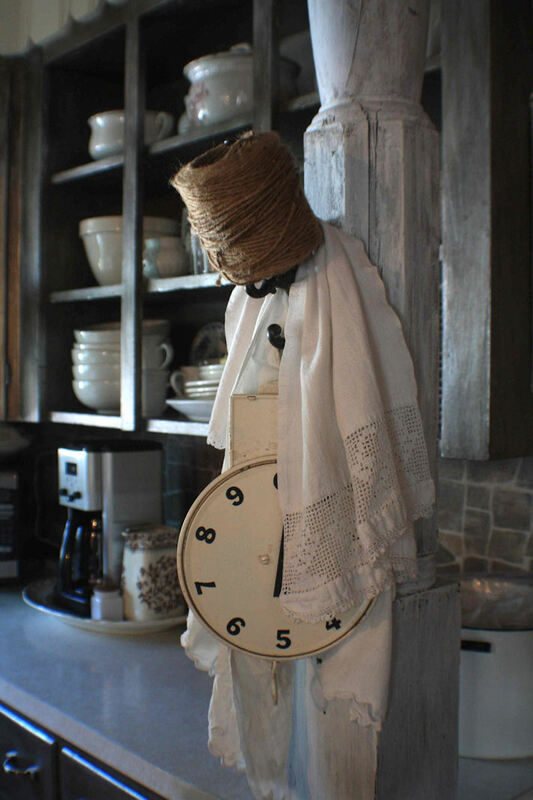 I sometimes add roman numerals to round pieces to portray a clock façade or I’ll place a cloche on a redesigned porch post column base. 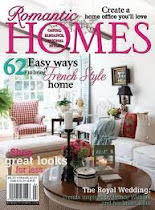 Joy, your farmhouse has been featured in several publications recently…tell us what it was like to have someone style and shoot your home. I am still in some shock that someone saw a reason to pursue me. I’ve been dreaming of this for the last twenty years and had decided it was not going to happen. I mean, I love it, but I was amazed and honored by the famous people that stepped in here to do their magic. I am humbled to say that they used a lot of my own styling ideas …which means they didn’t move much. From reading your blog we see family is very important to you. Are any family members following in your decorating/blogging shoes? 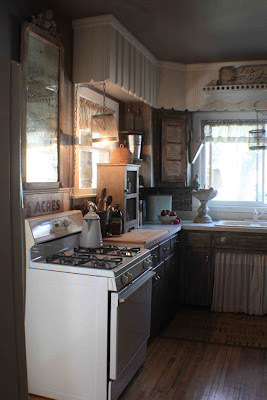 If someone came to you for advice on remodeling/decorating their farmhouse…what would be the single most important thing you would tell them? I started ‘listening’ to our house the moment we moved it. The walls began to speak. The house has a personality. Be sure to let it have its’ way. Then start buying the pieces and accessories that fit the home. Work with a builder who ‘gets it’ … some do and some do not. Interview, if you would and move on if someone will not work with your ideas. Incorporate architectural pieces, iron and found objects into the basic design. Remember to only buy what you love. I believe you can train your ‘eye’ to achieve the exact look you are striving for. Lastly, have fun with it. Break a few rules. If I think of a quirky idea I try it. If it pleases my eye I leave it, if not, I delete. Thank you, Laurie, for this opportunity and this beautiful feature. You are truly a savvy city farmer! Visit Joy's blog here and shop with her here. Now, it's your turn to share by commenting below, or by linking up to share some Farmhouse love with us. 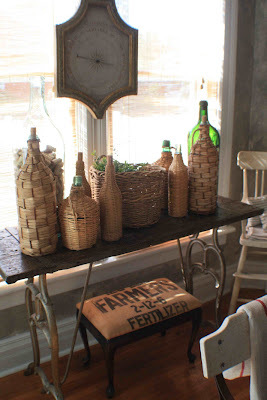 I love this farmhouse! My dream is to have one too! 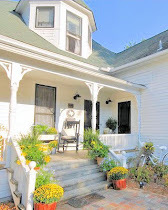 My Grandmother lived in one, built in 1849, and I adored it! Thank you for providing the opportunity to link. I always enjoy your blog! I love Joy !!! I think you made a fabulous choice featuring her as your second farmhouse. She is an amazingly talented lady who is also so very sweet and always takes time to stop by and say hello. Great choice again. Becky and Joy are both awesome!! Yes, I am reading Romantic Prairie Style right now! I haven't gotten to this house yet but, it looks familiar because i already walked through the book! Beautiful! I grew up in farmhouses and they are simplisticly fresh like no other interior. Fifi captures that well in the book! Thanks for having us! wonderful interview! Joy is amazing and so is her home, naturally. Thank you for hosting this lovely farm fresh party! 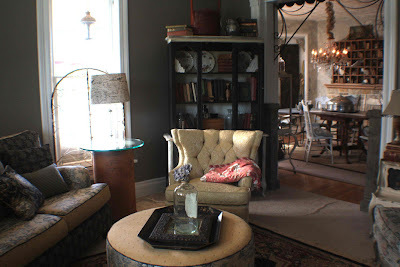 My goodness Joy has one beautiful home..thank you and her for sharing it with me...I'm still drooling!!! Thanks for this interview, LaurieAnna! I love Joy's style, and it was terrific hearing more about her. I'm honored to say that Joy is a good friend of mine. She is truly talented and genuine. Her home is so warm and inviting, and so is her family. This was a great interview and feature. That wrap around porch is gorgeous! I just love Joy's home!! It is so very beautiful!! you ladies have me in tears ... thanks from the bottom of my heart ..
Every photograph really captures the spirit of the people who live in that wonderful farmhouse. 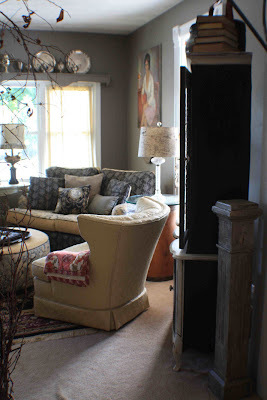 Thank you for featuring Joy on your blog, and thank you Joy for sharing your home and creative spirit. How have I missed your blog before. Thanks to Farmhouse Porch to telling me about it. I linked up (#44) and am a new follower. 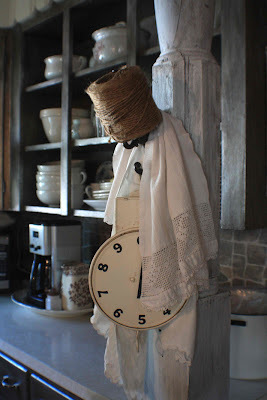 This is so my style, I love your blog. Wonderful interview! I have met Joy at the Shop The Shed events and she is the real deal, very warmhearted and friendly. She has fabulous design skills as well. Well...you know all that! Thanks for the great post! 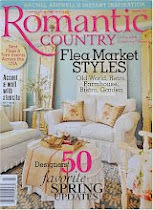 I love Joy's farmhouse and also have the book Romantic Prairie Style that features it. This was such a nice feature on her and her own personal style. 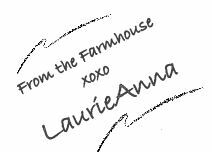 Love this party Laurie Anna! Thanks for hosting, I brought along my cottage kitchen. I love the farmhouse. 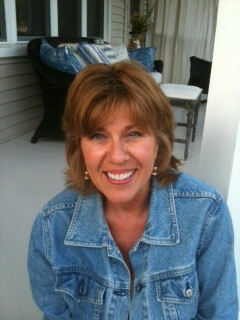 Just found you blog and am following!